Literature and publications on the Peranakan community are far and few in between, so when a new book on this unique group to the Malay Archipelago becomes available, it is always met with much excitement and anticipation, and the new “Baba & Nyonya Heritage Museum – Home of a Peranakan Family since 1861” is no exception . Fresh and hot from the publishers just a couple of weeks back, many of us await gleefully for a glimpse and surely, it did not disappoint. 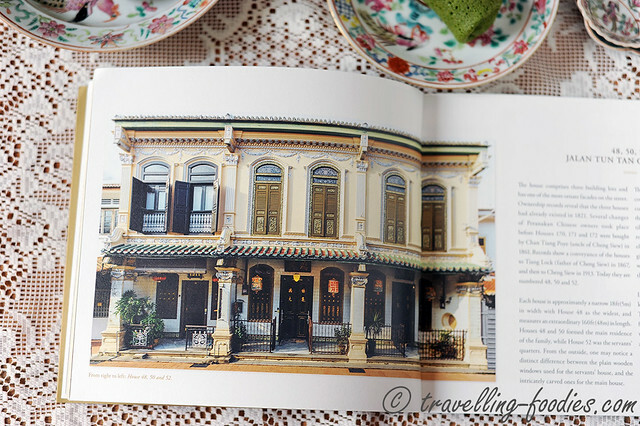 The beautiful cover sets the tone for the publication which runs contiguous throughout the book in its entirety, lavish and classy, as one peers through the wooden doors of the now Baba & Nyonya Heritage Museum, which was until about 30 years ago, home to the prominent Chan family along Jalan Tun Tan Cheng Lock, otherwise better known as “Heeren Street” in Melaka. The Victorian lamps on the ceiling cast a warm and soothing amber hue, allowing us to catch a brief glimpse of the interior, and at the same time illuminating the gilded embossed Chinese words on the doors which bears the family’s motto, 瑞興 Swee Hin in the top two characters, mirroring the ji ho wooden plaque hanging just above. The wooden doors slightly ajar beckon us to enter, seemingly an invitation to partake on a virtual tour around the museum, through the pages of this new book. Through the pages , the reader is taken on a tour around the museum, which is made up of three townhouses. Through the pintu pagair, the reader is “brought around” various sections the house , first with the “Thia Besair”. “Thia Datok”, “Thia Abu” before venturing further into “Thia Gelap”, “Chim Che” and up to the Master Bedroom before coming down to the Dining Room and finally the “Dapoh“. 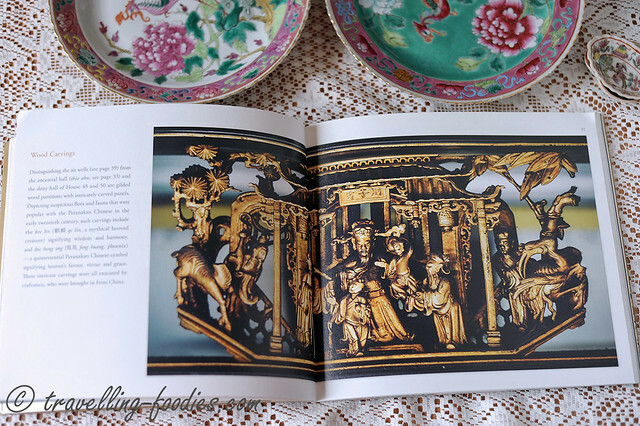 Interspersed between the pages of the “guided tour”, the reader is filled in with little anecdotes on the elaborated material culture of wealthy Chinese Peranakans from their porcelain, to the intricate wooden carvings which embellished every wall and corner of the house both interior and the external facade. 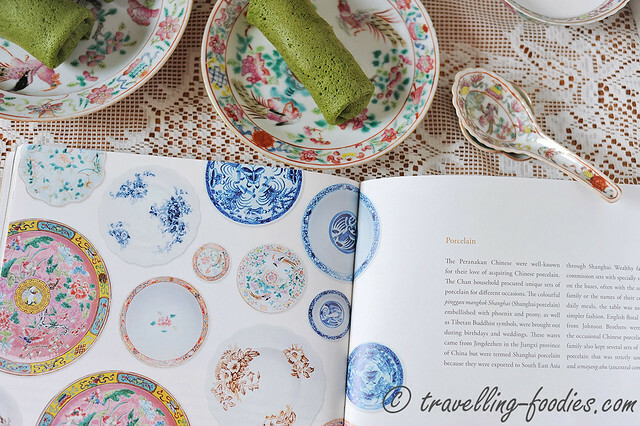 I personally love the macro shots offered in the book, allowing lovers of Peranakan material culture a chance to admire upclose and personal the details in some of these pieces which would probably have escaped noticed and easily missed otherwise. 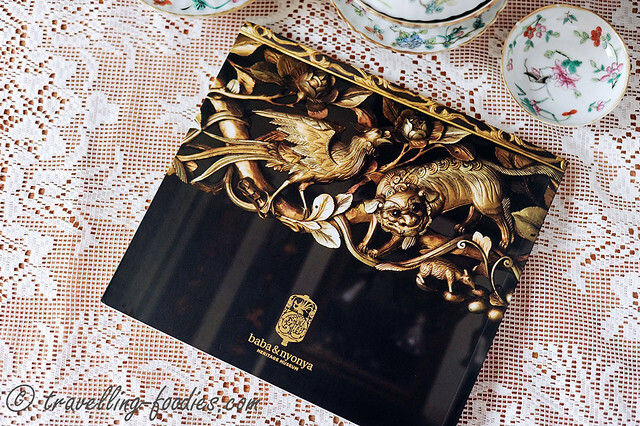 The lighting in the photos was also well choreographed to showcase the intricacies on the selected pieces featured in this book to the best accentuation. That said, flaws were shown unbashfully, like the deer without the head in the gilded carving above, signs of the inevitable wear and attrition the house went through over the last 150 years, a reminder to us that it was once very much lived in. 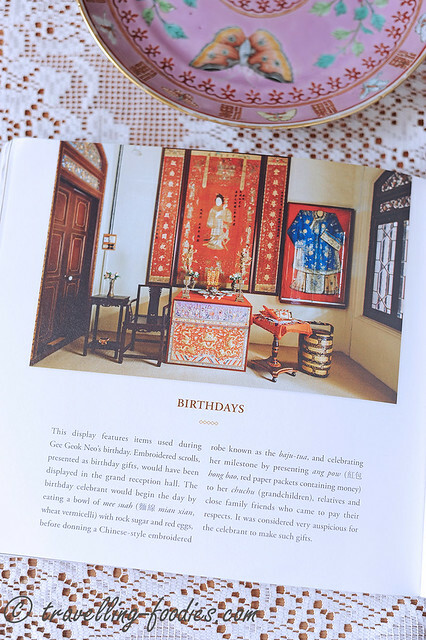 Towards the back of the book are chapters dedicated to the Peranakan ways of life from the more serious and solemn events and traditional ceremonies like weddings, birthday celebrations and of course a funeral setup, to the more casual where some favorite pastimes the nyonyas and babas of the yesteryears indulged in, though quite regrettably, the acts of chewing sireh and main cherki were not discussed in detail though there were part and parcel of what constitutes a bibik in the past. Likewise for the wedding ceremonies mentioned, only the cheo thau ceremony was discussed in slightly greater length with a photo of a beautifully set up tok samkai for the important occasion. Other important events like ki beh, chim pang, makan choon tok, chia lang kek for example were not mentioned. On the whole, I feel that the book is a good attempt by the museum considering it is their first publication. The descriptions provided for the interior architectural analysis of the museum are somewhat adequate, but I feel that something more could be said about its external facade. Though the significance behind some of the motifs found in the featured artifacts were explained in slightly greater depth, it is thought that more work could be done in relating the symbolism behind the other common auspicious motifs as well as colour scheme usage in a Peranakan household, particularly during important events like weddings and funerals. 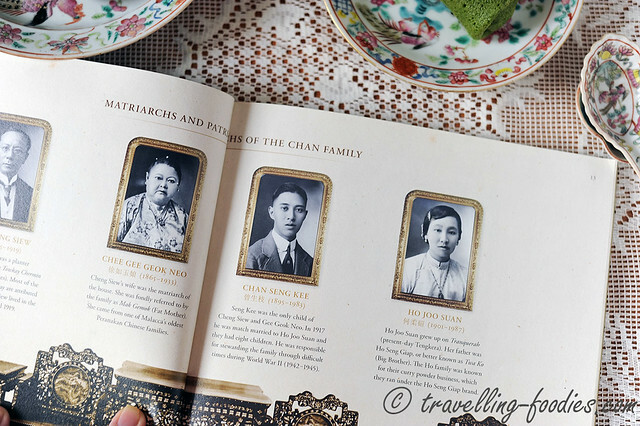 The textual components accompanying the photos were somewhat sparse and lacking in some areas, like a more detailed genealogy of the Chan family for example, would probably serve as very valuable information for anyone who are researching into the roots of Peranakan culture in Malacca. 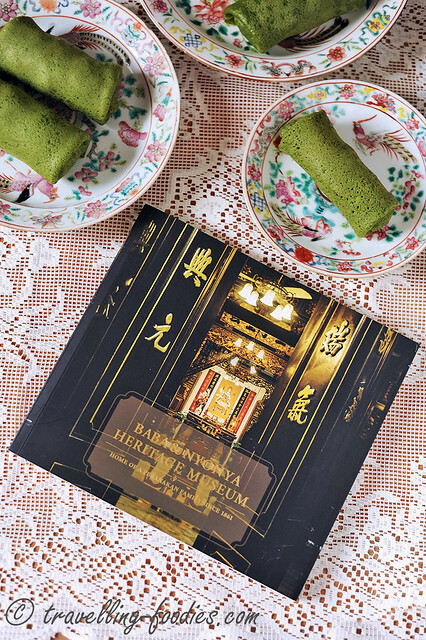 As mentioned earlier, perhaps the museum could explore in subsequent revisions of this book, the possibilities of including other aspects of the Peranakan wedding in hope to achieve a greater sense of completion and fulfillment. We may have Baba Cheo Kim Ban’s “A Baba Wedding” to fill us on the details, but an reenactment of the scenarios in photos and even illustrations would probably do those who wish to learn more about Baba Nyonya culture a great service. In summary, the book would probably do better with a bigger scope in mind, and also great depth of discussion, which I very much look forward to seeing in future revisions. That would invariably add value to the publication, beyond what it is now. Whatever is insufficient in text, the book makes up for it with very beautifully taken photos. A variety of angles and perspectives were employed , lending much visual pleasure in the reading process. Most photos display an important sense of artistic flair, and casting them in natural light makes the viewing experience all the more organic and natural on the whole. One thing I am particularly gladdened is to see the use of Baba patois in this book. This is afterall the unique colloquial tongue spoken by the Malaccan Peranakan community, from which wondrous tales of their colourful heritage and culture had been woven and retold over the generations. In a way it highlights to the reader an once integral part of the group which has become increasingly challenging to perpetuate especially amongst the younger generations of Peranakans. 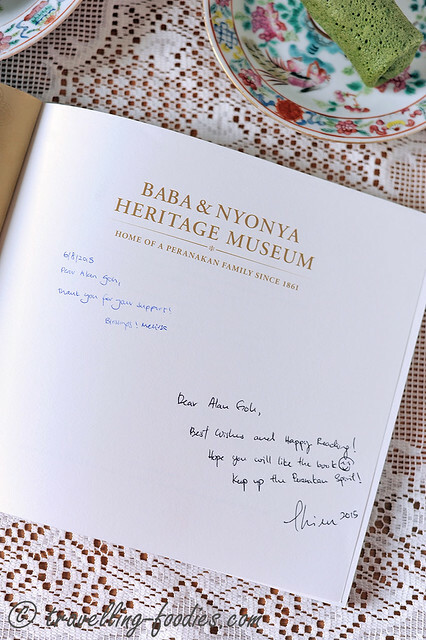 Though kept minimal to the nouns used, the efforts to incorporate Baba patois is commendable in preserving and maintaining the Baba Nyonya ways of life in one way or another. 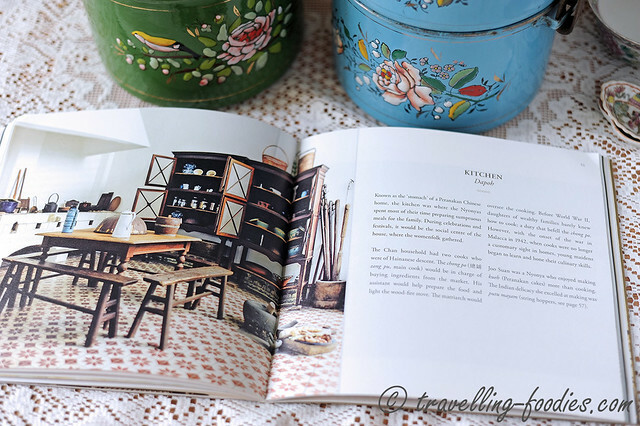 A big thank you to the Baba & Nyonya Heritage Museum for the opportunity to review this beautiful book. This entry was posted on August 28, 2015 by Alan (travellingfoodies). It was filed under General and was tagged with Baba, Baba & Nyonya Museum Heritage Museum, bakol siah, brown and gold, chan family, chan seng kee, cheo thau, heritage, makan choon tok, malacca, Nonya, Nyonya, nyonyware, peranakans, red and gold, straits chinese, warisan. Kindly advice how should I go about doing via post or where can I purchase it in my hometown? You can try “True Blue Shoppe” at the Perankan Museum in Singapore. Not sure where your hometown is but in Melaka, you can buy at the museum itself along Jalan Tun Cheng Lock.